QS Holding System from Sandvik Coromant is a timesaving and productive alternative to conventional tool holders used in Citizen Cincom sliding head machines. The quick set up of the system in the machine will be the key to small part machining success, as the QS kits help to reduce costly downtime by transforming tool changes into a two step procedure, compared to 5 steps required when changing conventional one piece tool holders. Individual kits are optimised for performance in specific machine types with short tool holder, stop and spring loaded wedge for high productivity. The single screw release of the tool holder will reduce tool change times from 3 minutes to 1 minute, while the spring loaded wedges ensure quick and safe extraction, and reduce the risk of dropping the holder. 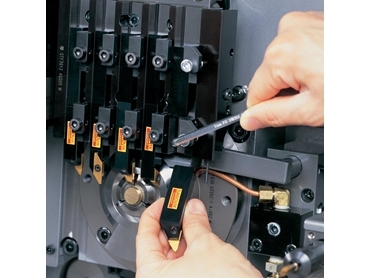 Once in the machine, the insert edge position is automatically set by contact between the short holder and the stop. The highly secure insert edge position of the QS system will improve accuracy with 30% less movement when front and back turning, while tool holders for the system are available in a wide range of productive Sandvik Coromant tooling solutions for results. The QS Holding System is a quick start to improved productivity, and is set to become the true standard on Citizen Cincom machines.